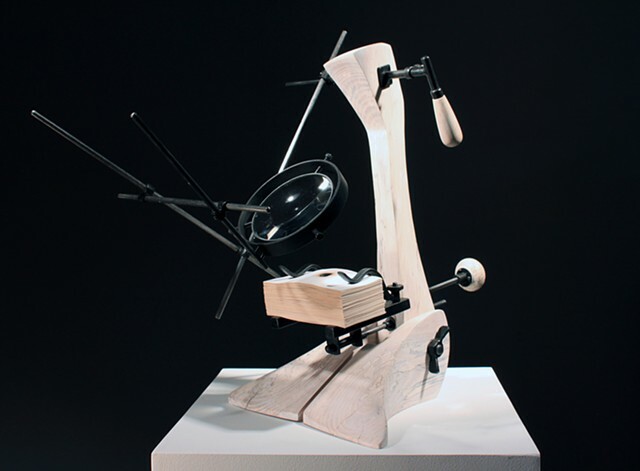 This sculpture uses the microscope and lens as a symbol for the need to carefully test any and all theories that are presented as scientific fact. Each sheet of paper is engraved with a disproven theory that at one time or another in history was viewed as a fact. By focusing sunlight through the lens and onto the stack of paper a hole has begun to be burned through each theory. This intended to be a reminder that as our tools for discovery advance, everything that we know to be true now is up for debate.